GLENDALE, AZ-Clemson quarterback Deshaun Watson will soon leave his collegiate career behind without winning the trophy as the best college football player in the land. But he just might take a national championship with him on his way out the door. Racking up a run of two straight appearances in the College Football Playoff National Championship Game and earning consecutive bids at winning the Heisman Trophy has turned Watson into a de facto star. Ohio State didn’t know exactly what that star would like when they took to the University of Phoenix Stadium football field in one half of the College Football Playoff semifinals. After the first 30 minutes of play, the Buckeyes found out that the Clemson star is lit. 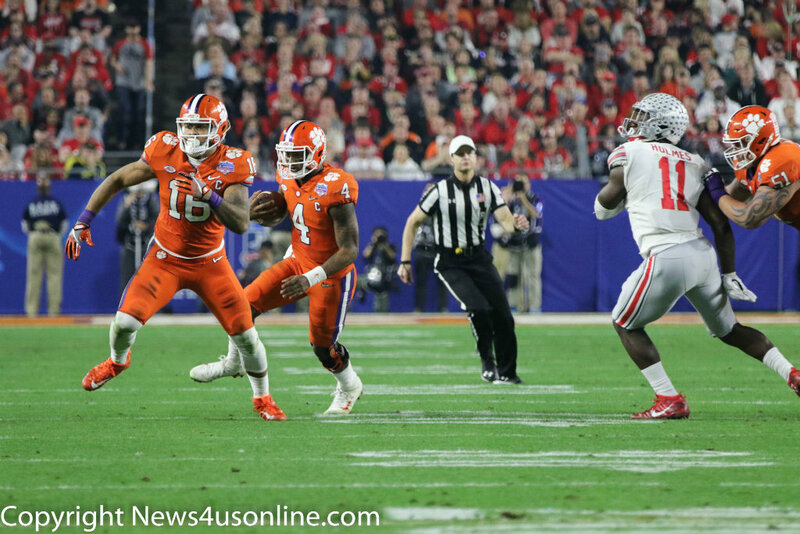 Clemson dominated the first half of its College Football Playoff semifinal game against Ohio State. Well, Watson and the Tigers dominated the second half as well, putting the crush in the orange to send the Buckeyes back to the state of Ohio feeling a bit doozy from the beat down they absorbed in the PlayStation Fiesta Bowl. And it wasn’t even as close as the 31-0 final score would indicate on the scoreboard. Watson and Clemson, playing the revenge game, will now get another shot to see if they can unseat the Big, Bad Wolf in college football, and that would be top-ranked Alabama. Last year, Alabama escaped with a 45-40 win in the national championship game over Clemson. 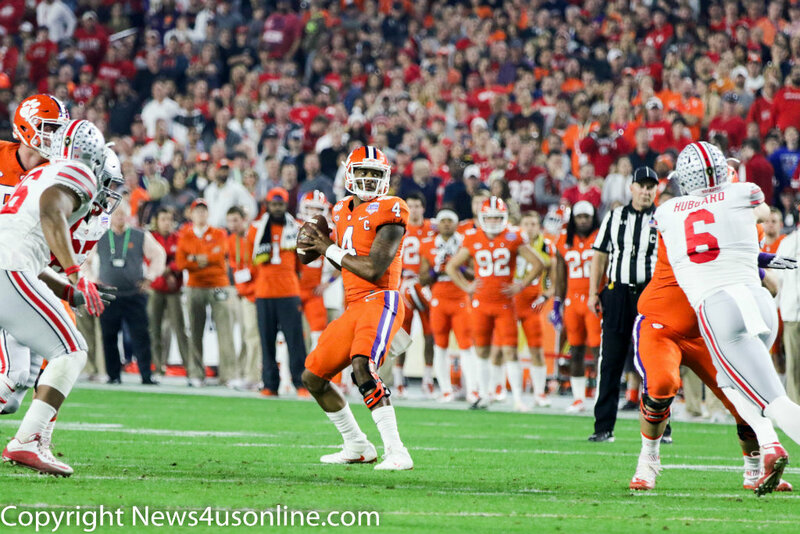 Just like he did against Ohio State, Watson scorched the Crimson Tide. Watson went nuclear on the Crimson Tide, passing for 405 yards and four touchdowns, while rushing for another 73 yards in his career-defining game. He didn’t go off like that against Ohio State, but Watson surely served a reminder to some people that he is THAT GUY, a leader with dominant skills to take his team to the next level. He’ll get that opportunity against Alabama again, but he made a strong enough statement against the Buckeyes that served notice to the defending champs. Though he was not at his best against the Buckeyes, especially with those two ill-advised interceptions he threw, it was clear that Watson was superior to everyone else that lined up between the goalposts at University of Phoenix Stadium. Officially, Watson threw for 259 yards and had a 30-yard touchdown pass to C.J. Fuller. Watson also added 57 yards on the ground, including picking up touchdown runs of 1 and 7 yards to make it a three-score game. Forget about that first series pick he threw. Watson had his way with the Buckeyes’ defense. He threw the ball where he wanted. He ran the ball where and when he wanted. There was nothing that Urban Meyers and his defensive unit could do. Sometimes there are no answers on how to defend a special talent like Watson. “Great player,” Ohio State coach Urban Meyers said in reference to Watson’s performance against the Buckeyes’ defense. Clemson quartetback Deshaun Watson (4) has finished as runner-up in the Heisman Trophy race the last two seasons. Watson is certainly a special kind of player, having been considered for the Heisman Trophy the last two years. You can make the argument that he should have at least one of the two times he was up for the award. Going back-to-back in bringing your team to the national championship game two years straight has to say something about you. Numbers don’t always do a player like Watson justice. With his three touchdowns performance against Ohio State, Watson ran his career total of touchdowns to 112. He’s also responsible for leading this current group of Tigers to a school-record of 73 touchdowns in a season, surpassing Clemson’s total of 71 in 2015. Watson is the type of player who can dominate game just by his presence on the football field. Ohio State defenders didn’t have a clue on how stop Watson, who put on his best Harry Houdini act on a couple of broken plays, and then turned around and sliced through the Buckeyes’ defense with crisp, precise passing. For the Buckeyes, the scenario that played out was probably their worst nightmare. Meyers and Ohio State knew what was coming, yet they failed to stop Clemson from completely dismantling them on a nationally-televised stage. The biggest boost of the night for Ohio State seemed to come Watson’s passing imperfections. Outside of Watson staring down his receiver on his first interception and wildly overthrowing his wideout on the second pick, Watson played Ohio State’s defense like a fiddler playing the violin. After losing out on the Heisman Trophy this season to Lousiville quarterback Lamar Jackson, speculation floated about whether Watson would use the snub as motivation to play well in the Fiesta Bowl. Watson said that was not the case.